Conductive elastic fabrics are desirable in wearable electronics and related applications. Highly elastic conductive polyamide/lycra knitted fabric was prepared using intrinsically conductive polymer poly (3,4-ethylenedioxythiophene) (PEDOT) blended with polyelectrolyte poly (styrene sulfonate) (PSS) using easily scalable coating and immersion methods. The effects of these two methods of treatments on uniformity, electromechanical property, stretchability, and durability were investigated. Different grades of waterborne polyurethanes (PU) were employed in different concentrations to improve the coating and adhesion of the PEDOT:PSS on the fabric. The immersion method gave better uniform treatment, high conductivity, and durability against stretching and cyclic tension than the coating process. The surface resistance increased from ~ 1.7 and ~ 6.4 Ω/square at 0% PU to ~ 3.7 and ~ 12.6 Ω/square at 50% PU for immersion and coating methods, respectively. The treatment methods as well as the acidic PEDOT:PSS did not affect the mechanical properties of the fabric and the fabric showed high strain at break of ~ 650% and remained conductive until break. Finally, to assess the practical applicability of the treated fabric for wearable e-textiles, the change in surface resistance was assessed by cyclically stretching 10 times at 100% strain and washing in a domestic laundry for 10 cycles. The resistance increased only by a small amount when samples were stretched cyclically at 100% strain, and the samples showed good durability against washing. Melkie Getnet Tadesse and Desalegn Alemu Mengistie have contributed equally to this work. Electronic textiles (e-textiles) are textiles that could provide electrical properties as electronics and perform physically as textiles which enable computing, digital components, and electronics which can be embedded in them. E-textiles combine electrical conductivity with flexibility, stretchability, wearability, wrapping large surface area for sensing, and making them an ideal for wearable electronics applications where the traditional rigid electronics are lacking. E-textiles cover a broad area of applications including thermal therapy , wearable energy harvesting/storage [2, 3, 4], real-time healthcare monitoring , electromagnetic interference shielding , and other flexible and portable wearable electronics applications [7, 8]. Conductive textiles are the most integral parts of e-textiles. 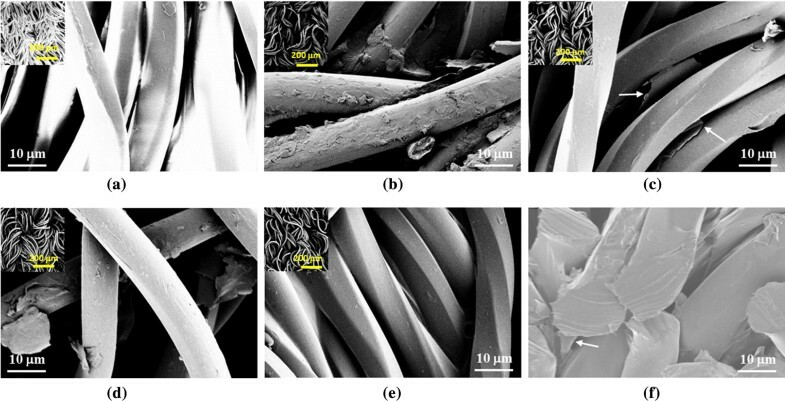 Conductive textiles have been produced by several approaches including electroless metal deposition , inserting metal wires in the fabric , using intrinsically conductive fibers and yarns , coating with conductive polymers [11, 12, 13], in situ polymerization of conductive polymers on the fabrics [14, 15], and pyrolysis of the textile . Producing conductive textiles by means of the coating technique with conductive polymers is quite interesting owing to its large area coating, compatibility with the current textile processing methods like dyeing and printing, and cost. Among the conductive polymers, poly (3, 4-ethylenedioxthiophene) (PEDOT) blended with polyelectrolyte polystyrene sulfonate (PSS) is quite promising due to its reasonably high electrical conductivity, aqueous processability, stability, and flexibility. Its conductivity can be significantly enhanced by using a number of processing agents including dimethyl sulfoxide, ethylene glycol, alcohols, and acids [17, 18]. There is a growing interest in deformable and wearable devices [19, 20]. For practical application of wearable electronics, in addition to flexibility, some amount of stretchability and elasticity is required to accommodate mechanical stresses and strains which arise due to intense body motions like folding and twisting. Stretchable electronics can be achieved broadly in two ways: using intrinsically stretchable conductive materials which can be obtained by compositing conductive filler with elastomer or attaching conductive materials on stretchable structure. The polyurethane (PU) elastomer has been widely used to make elastic conductive fibers and films for different applications [21, 22]. PU is highly elastic, scratch resistant, adhesive, and easy to apply to different substrates like textiles and has been in use for coating and printing of textiles . Conductive elastic textiles can be produced either by weaving or knitting inherently conductive fiber/yarn  or coating the elastic fabric substrate with conductive polymers . Coating the elastic fabric with aqueous-based conductive polymers which is easily applicable to the current textile processing techniques is quite interesting from processing, performance and cost aspect. In this work, we prepared conductive elastic polyamide/lycra knitted fabrics, which can be stretched up to 650%, by coating and immersion methods with PEDOT:PSS and different proportions of waterborne PU. The methods are quite versatile in which larger area samples up to 900 cm2 could be produced with uniformity and reproducibility, which mimic industrial printing and the exhaust dyeing of textiles, respectively. The fabric showed low surface resistance of ~ 1.7 Ω/square rivaling previous reports. We investigated the application methods and the effect of PU content on the electrical property, stretchability and washing durability. The samples were reasonably conductive while stretching until break, cyclic stretching, and ten washing cycles. To the best of our knowledge, this is the lowest resistance and highest stretchability with cyclic and washing durability reported for elastic conductive textiles. Polyamide (PA)/lycra fabric was produced using a circular knitting machine utilizing a yarn having a count of 78/44 Dtex. The thickness of the fabric is 0.41 mm as measured using universal thickness gauge meter. Conductivity enhancer dimethyl sulfoxide (DMSO) (99.8%) from Sigma-Aldrich and Zonyl FS-300 fluorosurfactant from DuPont were used as received whose chemical structures are shown in Fig. 1a. Silver paint was purchased from Agar Scientific, UK. The aqueous dispersion of PEDOT:PSS, Clevios PH1000, with a concentration of 1.3 wt% and PEDOT-to-PSS ratio 1:2.5 was bought from Heraeus, Germany. Waterborne polyurethane (PU) dispersions were obtained from Alberdingk Boley, and the details are listed in Table 1. Hydrophobically modified ethoxylated urethane (Gel L75 N, 48 wt%) from Borchers, Germany, was used for modifying the rheology (thickener) of the paste for the coating application of the conductive paste. PEDOT:PSS dispersion was first mixed with 0.1 vol% Zonyl surfactant and 5 vol% DMSO and vortexed to mix well and allowed to settle for several hours. Then, the required amount of PU dispersion was added dropwise using a syringe slowly while stirring the PEDOT:PSS mixture with a magnetic stirrer at 1250 rpm and stirring continued for 15 min for homogenization. The formulations were prepared with 0–90 wt% of the PU based on the solid content of the PU and PEDOT:PSS. This formulation was used for the immersion method of treatment. For the coating method, the appropriate amount of rheology modifier was added to a beaker containing the above formulation and then thoroughly and uniformly mixed with a mechanical stirrer at a speed of 650 rpm for 10 min to obtain a homogeneous conducting paste. When the amount of binder decreased, the amount of PEDOT:PSS increased in proportion and thus the viscosity decreased accordingly. This was compensated by increasing the amount of rheology modifier in amount to keep the viscosity sufficient for the coating as in Ref. . The PA/lycra knitted fabric was immersed in the PEDOT:PSS-PU composite dispersion for 5 min at room temperature by stirring gently. The immersion was performed only once. The coating method was done using ZUA 2000 (Zehntner GmbH) coating applicator . The PEDOT:PSS-PU dispersion with the rheology modifier was dropped on the fabric surface and squeezed manually with a coating applicator resulting in a paste thickness of roughly 0.5 mm. Finally, the samples were dried at 90 °C for 30 min followed by curing at 130 °C for 5 min using a laboratory mini dryer machine to obtain the conductive knitted elastic fabric. The electrical surface resistance was measured using an in-house designed and assembled four-point probe setup connected to a multimeter (Agilent 3401A) using Van der Pauw principle . The fabric samples were placed on flat insulating material, and the probe was placed on top of the fabric. To improve the contact between the probe and the fabric sample, a 2 kg weight was applied on top of the four-point probe equipment. Before testing, the samples were conditioned for more than 18 h under standard atmospheric condition. The surface resistance readings were taken after 1 min so that the readings were settled. The measurements were taken in both the course and wale directions four times, and the averaged results were taken. Scanning electron microscopy (SEM) images were taken with a Leo Ultra 55 SEM equipped with a field emission gun (LEO Electron Microscopy Group, Germany) and a secondary electron detector. The acceleration voltage was 3 kV. Samples were cut by a razor blade and imaged without metal sputtering on them. Tensile testing was performed using an Instron tensile tester (model 5565A) with 100 N load cell at a cross-head speed of 10 mm min−1 and jaw length of 20 mm. For tensile testing, a sample of 6 mm wide was cut in the wale direction by carefully hammering with a homemade spacer fitted with sharp blades. The change in resistance of the fabrics while stretching was measured using KEYSIGHT U1233B digital multimeter with flat crocodile clips by connecting to the ends of the cut fabrics (beyond the grips) with silver paste and copper tape for better contact. The resistance values were recorded at a 10% strain value difference. The change in resistance during cyclic stretching at 100% strain was recorded by interfacing the KEYSIGHT U1233B digital multimeter with a computer. To check the resistance relaxation, the samples were held for 1 min at 100% strain and again at 0% strain after each stretching cycle. The conductivity durability of the conductive fabrics against washing was assessed by washing up to 10 times using the domestic laundry washing machine using 100% polyester ballast by following the procedures of standard washing type 3A reference washing for textile testing (ISO 6330:2012). The samples were sealed using a laundry bag so that the washing reagent can penetrate easily into the sample and then placed in a laundry machine having 20 ± 1 mL of reference detergents. Washing was carried out at normal agitation at 30 ± 3 °C and 100 mm liquor level for 15 min followed by four consecutive rinsing cycles where each cycle lasted for 2 min. The specimens were then dried at room temperature before the next washing cycle. Coating and immersion methods were performed to fabricate conductive PA/lycra knitted elastic fabrics which mimic the industrial textile processes of coating/continuous chemical processing and exhaust dyeing, respectively. The immersion treatment was also done for a short time (for only 5 min) and hence can be easily upgraded to the commercial continuous padding technique. We prepared samples up to 900 cm2. The schematic diagram of the treatment methods is shown in Fig. 1b. The PU dispersion has been intensively used in textile applications as a coating material to increase the durability and softness of coated textile [23, 28]. Recently, PU is also being used as a composite material to make elastic conducting composite films [29, 30]. Combining these two, we prepared and investigated the electromechanical properties of the conducting elastic knitted fabric treated with different proportions of the conductive polymer blend PEDOT:PSS and the waterborne PU dispersion. We started by investigating the conductive formulation formation and electrical properties of the composite of PEDOT:PSS with different grades of commercial waterborne PU (U4101, U3251, and U2101) whose properties are given in Table 1. The U3251 and U4101 showed aggregated small particles when mixed with PEDOT:PSS even under stirring at high speed of 1250 rpm, whereas the U2101 showed homogeneous dispersion. Both the PEDOT:PSS and the waterborne PU are in dispersion form, and it seems that the alkaline PU is falling out of the dispersion and aggregating when mixed with the highly acidic PEDOT:PSS (pH ~ 2). We have noticed that some PEDOT:PSS coats these aggregated particles. Since they are commercial products, the exact compositions of the PU dispersions are unknown and we are not sure why there is a difference in the composite formation with different PUs. In U2101 case, some surfactant additives in the dispersion formulation might have helped it to stay stable when mixed with acidic PEDOT:PSS . Uneven coated surfaces due to the aggregated particles (dark blue colored) were seen on fabric surface when the coating was done using U3251 and U4101 in the conducting dispersion but not in the immersion case (Fig. 2). These unevenly distributed aggregations are undesirable as they will lead to non-uniform conductivity and they can potentially serve as points of de-adhesion during subsequent textile processes such as washing. In the immersion method, the aggregated particles were left behind in the bath and we got uniform dyeing/coating of the fabric (which appeared slightly light blue colored). Since there weren’t aggregated particles, the coated and immersed samples gave uniform appearance when the fabric is treated with the composite formulation having U2101 (except that the two sides are different for coating case). Also, we have noted that fabric becomes stiffer when coated with U3251 and U4101. But there was almost no change on the fabric feel when U2101 was used. As can be seen in Fig. 3, fabric treated with U2101 in the conductive formulation readily showed the lowest surface resistance for both the coating and immersion methods when compared to other PU dispersions. In the formulation containing U3251 and U4101, there are aggregated particles of PU and PEDOT:PSS which are not evenly distributed and hence there will be less effective PEDOT:PSS on the fabric leading to less conductivity. As it is expected, fabrics treated by immersion method showed lower surface resistance than those treated by coating method due to the presence of the insulating rheology modifier. Moreover, the immersion-treated fabrics are more flexible than those treated by the coating. The surface resistance was three times lower for fabrics treated with U2101 binder than those treated with U4101 and U3251 by immersion method (~ 3.7, ~ 11.4 and ~ 13.4 Ω/square for U2101, U4101 and U3251, respectively, at 50% PU loading). Surface resistance increased almost linearly with PU content in the conductive formulation but with different rates for both immersion and coating methods. Fabrics treated by the immersion method displayed surface resistance of ~ 1.7, ~ 3.7 and ~ 7.5 Ω/square, while those by coating method displayed ~ 6.4, ~ 12.6 and ~ 16.9 Ω/square for 0, 50, and 90% of U2101 in the conductive formulation, respectively. The corresponding calculated conductivities are ~ 14 and ~ 3.8 S cm−1 (taking the whole bulk of the fabric) for fabrics treated by immersion and coating methods with 100% PEDOT:PSS which are superior than previously reported values even done with multiple immersion in PEDOT:PSS [25, 26, 31]. It is expected that in the immersion method, PEDOT:PSS diffuse easily and penetrate into the structure of the fabric, yarn, as well as the fiber. Earlier reports showed that there is dyeing effect on silk when treated with PEDOT:PSS by immersion method . As both PA and Lycra contain amide functional groups, we also expect some sort of dyeing rather than a mere coating. Hence, in the immersion method PEDO:PSS easily and uniformly diffuse in the yarn and fiber pores leading to better dyeing/coating and later better conductivity and durability. Since the U3251 and U4101 binders gave aggregated particles during mixing and hence lower conductivity, we therefore chose PU2101 for further investigations. A closer inspection on the surface of treated fabrics by SEM shows that there is some difference on the surface of the fabric between coating and immersion methods even using U2101 binder (Fig. 4b–f) though they looked the same homogeneous visually as well as under low magnification SEM (insets in Fig. 4). Both the coated and immersed fabrics were conductive enough and there weren’t charging artifacts which are present for the untreated fabric (Fig. 4a). The surface appearances of the coated and the immersed fabrics are quite different; those treated by immersion show more even and smooth appearance, while those by the coating method show uneven agglomeration due to the rheology modifier. The rheology modifier concentrated more on the fiber intersection when a coating was done without the PU binder and coats the fibers in the fabric in a better way when 50% PU was added in the coating formulation (Fig. 4b, d). In the immersion method, even though the surface appears smooth without PU, there are thin (about 100 nm) PEDOT:PSS films between fiber interfaces (see Fig. 4c, f arrows). Adding PU makes better coating of PEDOT:PSS on the fiber surface without delaminated thin films (Fig. 4e) . As both PA and lycra are acid resistant, acidic PEDOT:PSS treatment didn’t affect the mechanical properties of the fabric (Fig. 5). A similar case was reported for silk , whereas cotton showed a serious mechanical degradation due to acid hydrolysis of cellulose [3, 32]. The fabric maintained stress of ~ 15.5 MPa and strain of ~ 650%. The trend is the same for fabrics treated with different amounts of PU in the conductive formulation. Such high stretchability is the combined effect of the elastic Lycra and the knitted structure. The stretchability of the conductive materials in the wearable e-textile application is very important. Such highly conductive and stretchable fabrics would find various applications in wearable electronics. For stretchable conductive materials, the change of resistance during stretching is an important parameter. 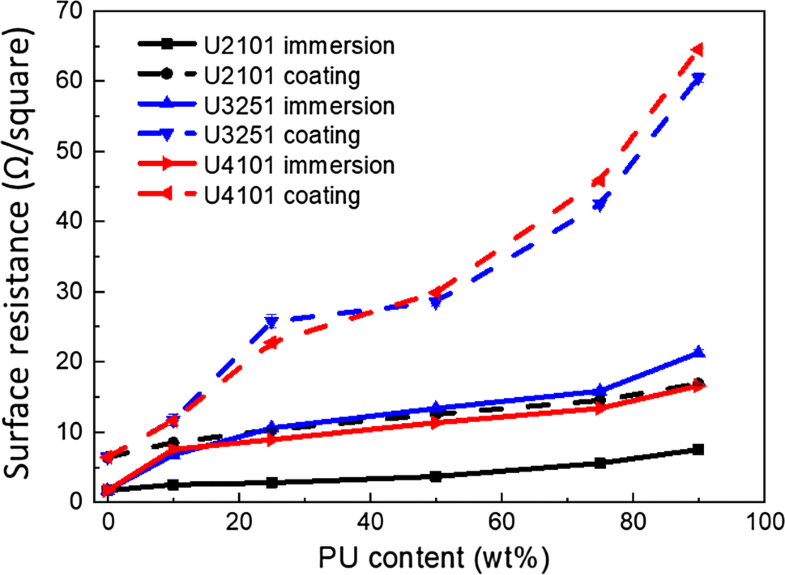 Figure 6a–c shows the relative change in resistance of fabrics treated by both the coating and immersion methods with different U2101 PU content in the conductive formulation when stretched until a break. What is interesting is that the fabrics were reasonably conductive until they break (~ 650% strain) for all PU content (except for fabric treated with 90% PU by coating method which becomes conductive only up to 300% strain). Both the coating and the immersion methods showed very little increase in resistance when the fabric is stretched to 100% strain. Wallace’s group experienced an opposite phenomenon to this where there was a decrease in resistance at lower strains for nylon/lycra knitted fabrics treated with polypyrrole by oxidative polymerization . This might probably be due to weave density difference in the fabrics we used. But after 100% strain, the increase in relative resistance of the coated samples was almost twice to that of the immersed samples. The main reason for this difference is that there is less amount of conductive PEDOT:PSS in coating method than in the immersion method and when stretched at higher strain the conductive pathways are disconnected and lead to fast resistance increase. The effect was more pronounced for fabrics coated with 90% PU formulation in which the relative resistance increased to ~ 4600 times at 300% strain, whereas it was only ~ 28 times for fabrics treated by the immersion method. The effect of PU content on the resistance change was insignificant up to 50% PU for both the coating and immersion methods of treatment. 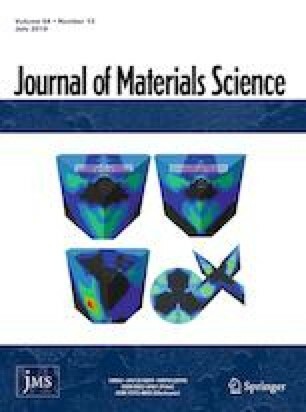 This is quite interesting as we were expecting fabrics treated with more PU would maintain their conductivity when stretched better than those with less PU content. This could be attributed to the high stretchability of the elastic fabric than the PU composite. When the stretchability of the fabrics is greater than the stretchability of coating material, the stretchability of the coating material brings little impact on maintaining the conductivity during stretching. The other important reason is that PEDOT:PSS is not present as a film on the fabric surface rather has more dyeing effect as reported previously. When the fabric is stretched, the conductive particles become far apart and hence there will be reduced conductivity. If there is only coating by film formation, the film gets cracked at lower elongation, especially with 0% PU loading, since PEDOT:PSS film has low stretchability . In an attempt to minimize the increase in resistance while stretching, we tried to pre-stretch the fabric at 100% before coating. However, there was no appreciable change observed due to pre-stretching (Fig. 6c). For practical wearable e-textile applications, fabrics will not be stretched to such high strains. They rather are repeatedly stretched at lower strains. We, therefore, tried to assess their practical applicability by cyclically stretching at 100% strain for 10 cycles while monitoring the change in resistance simultaneously by interfacing the Keithley connected with the fabric on the tensile machine with a computer. Figure 7a–d illustrates the influence of cyclic stretching on the electrical resistance of the fabric treated with 10% PU in the conductive formulation by the immersion method (the trend is the same for other PU contents in the conductive formulation). 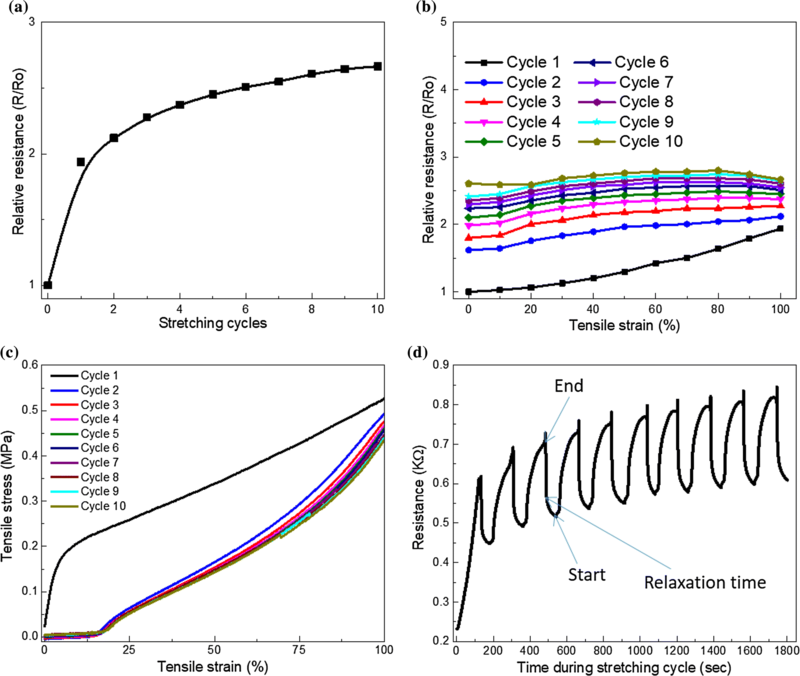 The relative resistance increases more rapidly during the first cycle of stretching to ~ 2 times and then only monotonously reaching ~ 2.7 times after 10 stretching cycles (Fig. 7a) which is in line with previous reports [25, 35]. After the first stretching cycle, the increase in resistance values while stretching was insignificant (Fig. 7b). The fabric showed hysteresis of about 17% strain after the first stretching cycle which remained stable thereafter (Fig. 7c). When the fabric was held for 1 min at 100% strain, the fabric attempts to regain its conductivity during relaxation (Fig. 7d). This is quite helpful during practical applications as the fabric will be cyclically strained at low strains and the fabric will regain its conductivity when the stress is released. In line with the conductivity and change of resistance during stretching, the coated samples also showed higher resistance changes than the immersed samples (figure not shown here) during cyclic stretching. The capability of conducting fabrics to overcome a perpetuating environment is very important for use in e-textile applications. We, therefore, investigated the influence of washing on the electrical conductivity of the PA/lycra knitted elastic fabrics treated with different content of PU in the conductive formulation by the immersion method. The samples were washed using the domestic laundry washing machine with extra polyester ballast fabric included with the sample to fit the standard weight. Figure 8 shows the relative change of resistance of fabrics up to 10 washing cycles. PEDOT:PSS free-standing films easily disintegrate when immersed in water and the effect will be worse with vigorous washing actions. However, fabric treated with only PEDOT:PSS by immersion method maintained some conductivity up to 10 washing cycles which clearly shows that there is dyeing effect as mentioned before. In order to avoid these challenges and to increase the durability of the sample, the waterborne PU dispersion was employed so that the conductive polymer could firmly adhere to the fabric surface. As expected, the washing stability of treated fabrics is a function of the PU added in the conductive formulation; increasing the binder PU content results in increased washing stability for the conductive PEDOT:PSS. PU increases the stability of PEDOT:PSS against washing on the fabric surface by gluing it firmly with the fiber and hence increasing the capability to withstand the effect of laundering . 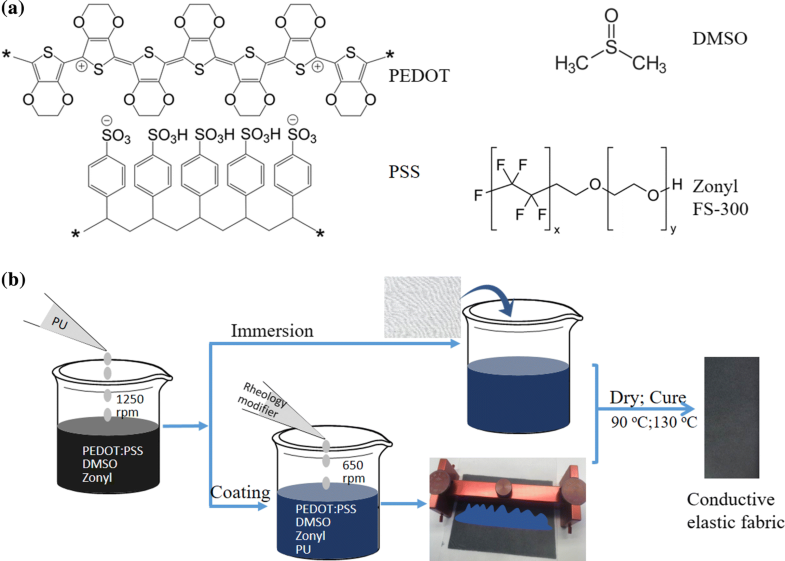 The surface resistance increased to ~ 7× and ~ 5× after the first wash and to ~ 75× and ~ 23× after the tenth wash for the 0% and 90% PU in the conductive formulation, respectively. The conductivity stabilities to washing of our samples rival previous reports [37, 38]. In conclusion, we developed conductive elastic PA/lycra knitted fabric by treating with PEDOT:PSS and PU binder with facile and easily scalable methods of coating and immersion which are similar to the commercial textile processes of coating and exhaust dyeing. 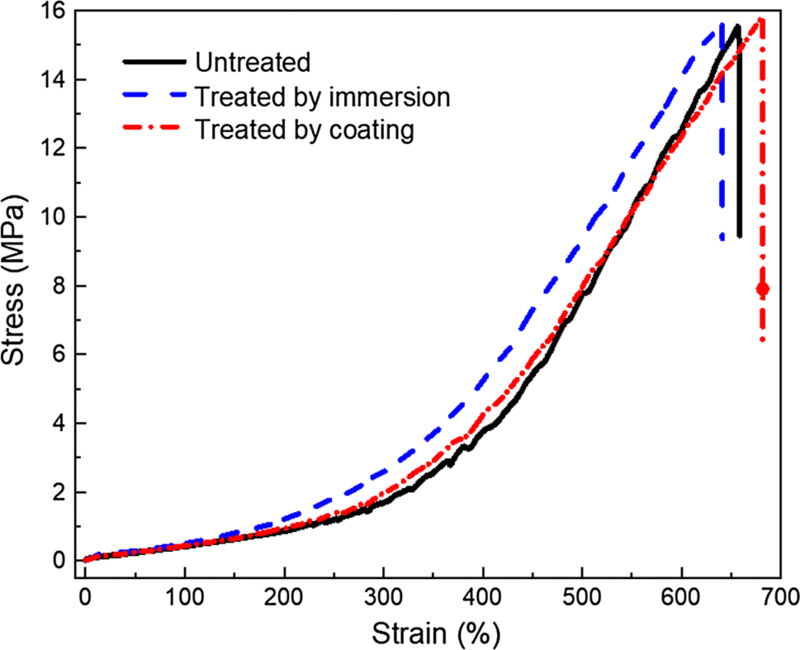 The immersion method gave more uniform and better conductivity than the coating method, and surface resistances as low as ~ 1.7 and ~ 6.4 Ω/square were obtained for immersion and coating methods, respectively. Acidic PEDOT:PSS treatment didn’t affect the mechanical performance of the fabric and the treated fabrics remained reasonably conductive until breakage when stretched (~ 650% strain). When the fabrics were stretched at 100% strain for 10 cycles, the resistance increased only to 2.7 times showing the practical usability of the method. The PU used didn’t affect the change of resistance during stretching. Hence, if we aim high conductivity and stretchability, immersion method without PU is more advisable. 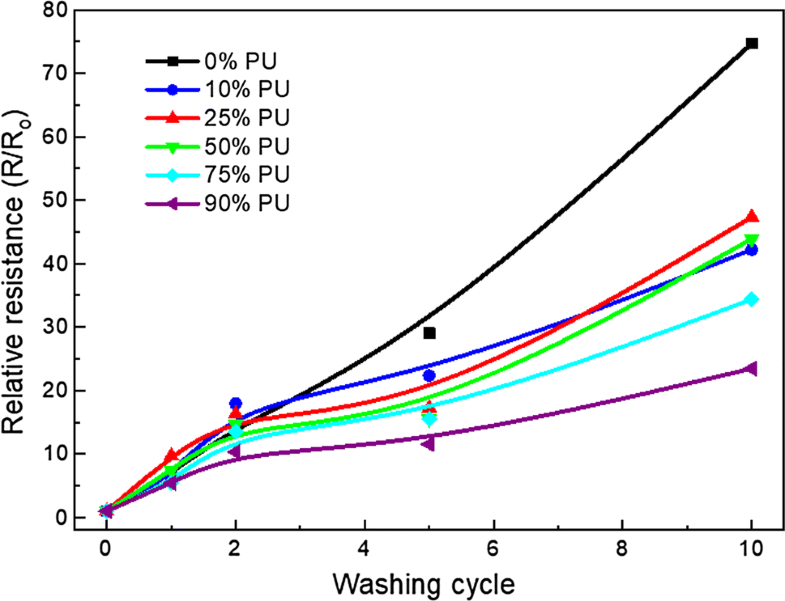 However, the PU addition improved very well the conductivity durability to laundering and maintained reasonable conductivity after 10 washing cycles using domestic laundry. The immersion method was found to be a more effective method for achieving high conductivity, durability against stretching, and cyclic stretching than the coating method. As large area sample sizes can be easily produced and the fabric maintained its original flexibility, the highly conductive elastic knitted fabrics will find promising applications for various wearable e-textiles. This work has been financially supported by Erasmus Mundus Joint Doctorate Programme SMDTex-Sustainable Management and Design for Textile (grant number n_2015-1594/001-001-EMJD) and the European Research Council (ERC) under grant agreement no. 637624. We thank Prof. Christian Müller from Chalmers University of Technology for using his laboratory facility to do mechanical testing and SEM characterizations. The authors declare no conflict of interest in research and publication.